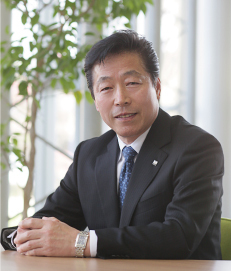 Message from our President | MAEDA SEISAKUSHO CO.,LTD. The main business of our company is the development and manufacture for the supplying of our original products, Mini Cranes , distribution, after sales service and the rental of Komatsu products in the central Japanese areas. Our message in these core areas of business is to contribute to our customers profitability by offering service, but to encompass our motto of " Sincerity, Willpower and technology". By faithfully implementing this motto we are aiming to achieve excellence as a company widely trusted and relied on by society. Also as a conciencous corporate citizen we will continue to fulfil social responsibility by following our philosophy of corporate code of conduct. As a manufacturer of cranes we consider" Safety and Quality as priority". With over 50 years of manufacturing experience we believe offering Safe and High Quality products can lead to our customers profitability and therefore that leads to gain in trust from our customers. We are aiming to become the Number 1 mini crane and crawler crane manufacturer by listening to our customers requirements and to develop our product by continual improvement and contributing to safer working practices and more economical solutions. In fact I was taking part the roll of a Mini Crawler Crane development engineer in the past. I personally experienced many failures during the ongoing process of making this new category of product, but I feel nostalgic when I recount my memories when I never gave up and continued by trail and error. I would like to supply our range on Mini Cranes that we manufacture to as many potential users as possible, like we have as accompany to date and looking to the future also. And finally the collective staff of the Maeda group of companies thoroughly adhere with the" Safety, Health and Compliance" and supply of excellence of service to our customers and also to further endeavour to secure soundness and clarity in management.